Toward the end of April we asked Movin’ On Up readers how they coped with workplace stress. Stress can cause a variety of health problems, from slight headaches to major anxiety, so we wanted to see what our readers were doing to get through it. The results were fairly close across the board. Just under 22% prefer to listen to or play music, 17.5% work through their problems by talking to others, and 14% exercise. Thirteen percent turn to hobbies, while an additional 12% take time to meditate or practice breathing exercises. Seven percent opt for a relaxing massage, and only 4% choose to look at cute animal pics. Just under 10% selected “Other,” with responses ranging from watching Netflix or TV to playing video games or praying. So how can job seekers use this information? Everyone has their own “thing,” their own way of dealing with stress. That’s the first thing job seekers need to do—figure out what their “thing” is! Look at all of the survey options and figure out what really calms you down. And if that doesn’t work, invent some of your own. Everyone has different levels and types of stress, so the way each person deals with it is going to vary too. 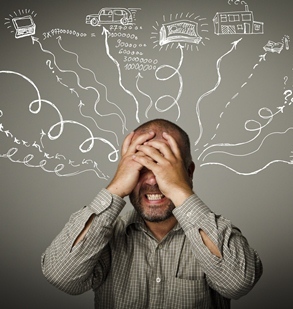 Anything else you want to tell us about how you deal with workplace stress? Let us know in the comments below!